Tadashi Nishihata is one of the most celebrated artists from the Tamba region of Japan. Coming from a family of potters who have practiced in the area for several generations, he has built on his family and the area's ancient techniques, re-inventing his own style of Tamba ware. Nishihata was born in Tamba (also spelled Tanba), a 600 year old pottery center in Hyogo prefecture, in 1948. He started apprenticing with his father, a well-known Tamba potter, Sueharu Nishihata, in 1969, before working independently. Since that time, he has developed his own aesthetic, inspired by natural forms and the nature that surrounds him. His inspiration is evident in his works, which often look like landscapes themselves, reflecting the mountains, snow, and the changing seasons. 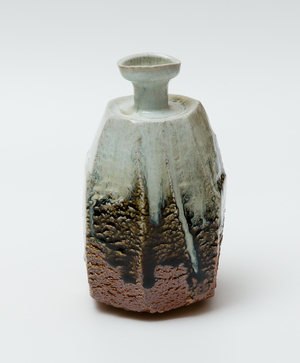 His son, Daibi Nishihata, also studied Tamba-style pottery and exhibited widely throughout Japan before his sudden passing in 2010. Nishihata is known foremost for his mastery of finishes, especially of his re-invention of the akadobe glaze, a deep red clay glaze, which had been used for many years during the Edo period, not only as a glaze but as a sealant, but for which the method had been lost. He spent much of his career experimenting with different types of clay and firing techniques in an attempt to re-create the glaze, and after thirty years, succeeded in creating his own warm, deep red glaze, which he now uses in many of his works. In addition, he uses his own ash glazes to create the appearance of natural forms, often layering one upon another. His "opal" glaze is an ash glaze made from the ashes of rice plant and different types of wood, which turns to an opal blue color during firing. Nishihata has won several prestigious awards, including the Grand Prize of Tanabe Museum of Art's Chanoyu Zoeki Ten (Modern Tea Forms) Exhibition, which he was awarded a record-holding three times. He continues to exhibit widely throughout Japan and abroad. Please visit our Nishihata items for sale here. You may also read more about Tadashi Nishihata in tagged posts on our blog.